The aluminum shutters they provide an unbeatable acoustic and thermal isolation. A good election of the type of shutter or blind of aluminum reduces significantly the noise level, as well as the entry of cold and heat. 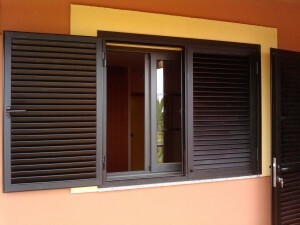 CORRECT USE OF FIXED SHUTTERS OR BLINDS ROLL UP. We suggest you to clean any type of blinds (fixed shutters or blinds roll up) with a humid cloth or a feather duster. In case of the blinds roller up, before raising or lowering the shutters, put the lamellae in the horizontal position of “opened”. This will allow your blind not breaking incidentally. To lower the blind please pull down gently the drawstring towards the left and down until the secure lock comes undone. Allow the drawstring to slide on your fingers until the blind is down at the desired level and then move the drawstring towards the right so that to get stuck in this point. To raise the blind pull the drawstring down until the secure lock of the blind comes to level desired. In this case release the drawstring to keep at that level.